>>> >>>>>>> Any help? References? Howto? 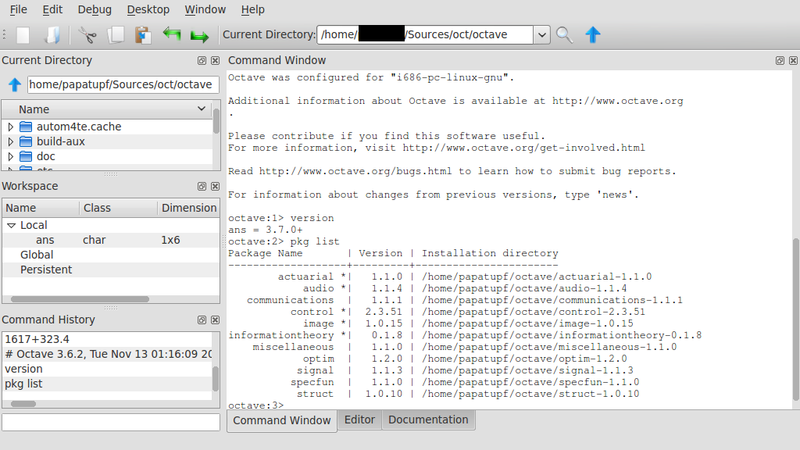 >>> >>>>>>> I know that Octave GUI is unstable. >>> >>>>>>> Could be these included in FAQ? >>> >>>>>> I think this mail should go to the help mailing list. >>> >>>>>> processors/cores you have in your machine. >>> >>>>> => you have to install "sudo apt-get install libtool"
>>> >>>>> => (and) "sudo apt-get install automake autoconf"
>>> >>>>>          `Flex' from any GNU archive site. >>> >>> Thanks for your reply. >>> >> What GNU/Linux are you using? >>> > flex is already the newest version. >>> Ok, I had to ask help to jwe for this one. >>> END, ELSE, etc. should be defined. Ok, as I understood you manage to compile it. I removed the maintainers list.